theswca blog: Did "Star Wars" Kill the LP Logo? Did "Star Wars" Kill the LP Logo? Kenner debuted the LP logo in 1975. It stood for "Logray's Pants." Just kidding. It was actually short for "long playing." The logo was intended to demonstrate to consumers that each Kenner toy had been tested for fun, safety, and reliability. The promotion was pitched to retailers via the 1975 Toy Fair catalog. Kenner actually devoted the entire front cover to the logo rather than to one of their hot properties, like Snoopy or The Six Million Dollar Man. Wait . . . what is she doing to that Play-Doh elephant? The catalog's back cover featured a verbose pitch concerning the logo. In it Kenner claimed to have done "extensive research" to determine how best to communicate the concept of longplayitude to the American toy consumer. I'm imagining a team of researchers toiling for years conducting surveys across the back roads of North America. Exhausted, low on supplies, one of them throws up his hands and says, "Screw it, let's just put a blue circle on the box." The last page of the catalog touts Kenner's advertising campaign. Note it focused on parents. I think it's likely that the LP program was part of this parent-focusing effort. Makes sense. What kid bases his I-want-this-toy decisions on factors like durability and reliability? Of course, Star Wars collectors know the LP logo because it appeared on 1978 products, including the initial releases of the first 12 action figures. However, the logo was gone the following year; most of the products re-released in 1979 featured packaging that had been stripped of the little blue circle. 1975 to 1978. That's not a very long run. I guess you might say the "long-playing" logo didn't play for very long. I've never heard a convincing explanation as to why Kenner killed it. 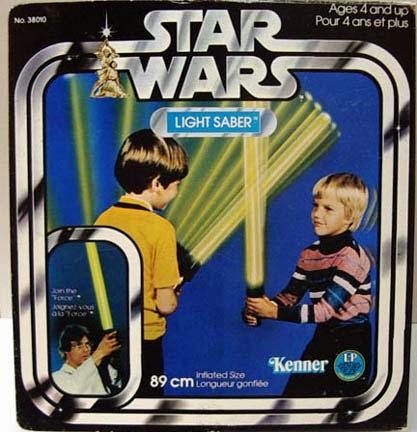 But here's my theory: The quality of some of Kenner's Star Wars toys was so poor that the company was embarrassed to continue advertising their wares as being durable, reliable, and long-playing. Okay, before you start crying that Star Wars toys were the most important things in your little-kid life, saved you from multiple life-crippling depressive episodes, and should have been elected president, let's pause to consider the longplayosity of a few Kenner SW products. How many of your Jawa figures acquired Orko-style levitational powers when the elevator mechanism on the back of the -- ahem -- "Sandcrawler" disintegrated the third time you tried to use it? Admit it: The toy was a piece of junk. To be fair, it was released in '79 and never bore the LP logo. Still, it was in the planning stages in '78, and the stink of it must have been wafting through the corridors of the Kroger Building right around the time the powers at be at Kenner were muttering, "Ixnay on the onglay ayplay." This thing actually shipped with a repair kit. The packaging might have left a parent feeling proud to have purchased a sturdy and thoroughly tested "long-playing toy." But once he opened the box he found evidence to the contrary staring him right in the face. Think about it: Opening a "long-playing" toy and finding that it comes with a repair kit is a bit like opening organic-labeled cereal and finding that it comes with a complimentary pouch of DDT. Records indicate that approximately 98% of these toys broke within two hours of being opened on Christmas morning. The other 2% were simply thrown out by kids who were embarrassed to be seen playing with it. According to Kenner sources, the company experienced major problems with this toy. Many were returned for mechanical adjustments -- so many that scores of them remained stacked on pallets in the employee store long after the product had been released. Similar problems affected the Sonic Controlled Landspeeder and Radio Controlled Jawa Sandcrawler; the former even shipped with a little adjustment kit so that consumers could noodle with the thing when, inevitably, it stopped working and turned into a Push Controlled Landspeeder. 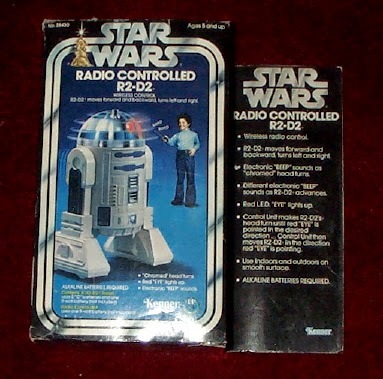 All things considered, I don't find it surprising that Kenner never made another wirelessly controlled Star Wars toy. 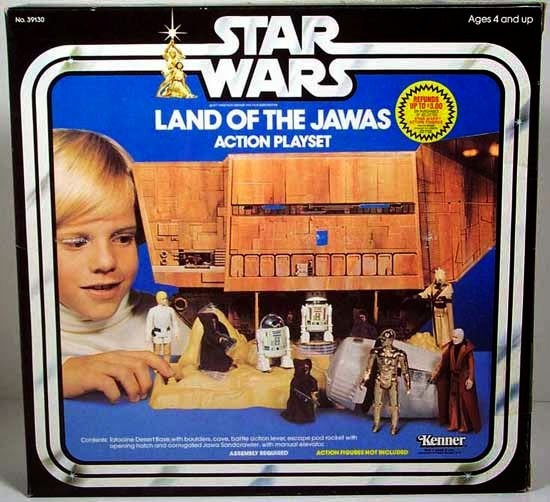 So, yeah -- Kenner made some junky Star Wars products. But I guess when you have a license like Star Wars quality doesn't matter so much. People are buying the movie connection more than the toy. To me, the LP logo belongs to the old, pre-Star Wars Kenner -- the one known for making innovative activity toys like Chip Away and Girder and Panel. The post-Star Wars Kenner was different: It was a company looking for licenses, especially ones with hot media tie-ins. To that Kenner longplaytitude was a secondary concern -- even if they really did care. This article reeks of salvatority. Another great article. I guess that it'd be difficult for kids to convince their parents that they needed more than one Stormie, for example, if Kenner stressed the fact that these toys lasted. I know with my parents I had to show my very, very badly disfigured figure before I had any chance of getting a second. If the toys were meant to be LP then I'd imagine my mother would have contacted the shop to complain and asked for an exchange. A broken Falcon strut? Off to the shop and ask for a replacement! No, demand would be more accurate. I've also wondered if there's a possibility that some kids got mixed up between LP logos and POPs? Or perhaps Kenner's marketing guys were concerned about it possibly happening? It's definitely similar to the POP. I think they could have made the two seals look more different if they'd wanted to, though. Ron, my recollection from talking to a Kenner engineer or designer (one of the Westin days I think) was that the LP moniker was ultimately considered a marketing overreach and set up expectations they couldn't always meet. Sort of the opposite of "under-promise and over-deliver." I specifically remember this person referencing that internally they called the "Close and Play" record player "Close and Pray." The problems with the RC R2-D2 were definitely noted multiple times, too, and I remember a designer saying there were pallets of returned stock in the Kenner warehouse. Yeah, I remember "Close and Pray." I'm sure that guy is the source of the RC R2 story too.